A team of European astronomers  has found a cold and extremely faint object in interstellar space, high above the galactic plane. It is a Methane Brown Dwarf of which only a few are known. This is by far the most distant one identified to date. Brown Dwarfs are star-like objects which are heavier than planets but not massive enough to trigger the nuclear burning of hydrogen and other elements which powers normal stars. They are, nevertheless, heated during their formation by gravitational contraction but then continuously cool as this energy is radiated away. The so-called Methane Brown Dwarfs are the coolest members of the class detected so far, with temperatures around 700 °C, i.e. around 1000 degrees cooler than the coldest stars. The new object, provisionally known as NTTDF J1205-0744 , was found during a deep survey of a small sky region in the constellation Virgo (The Virgin), just south of the celestial equator. The chances of identifying a rare object like this in such a restricted area are very small and the astronomers readily admit that they must have been very lucky. This is the story of an (unexpected) astronomical discovery that may prove to be very important for galactic studies. It also demonstrates the power of modern observational techniques. A long series of exposures of a small sky field in Virgo were made in 1997 and 1998 with the ESO 3.58-m New Technology Telescope (NTT) at La Silla. They were carried out with the aim of measuring and demonstrating the limiting performance of two astronomical instruments at this telescope, the SUperb-Seeing Imager (SUSI) in the visible part of the spectrum (0.35 - 1.00 µm), and the multi-mode Son of ISAAC (SOFI) in the near-infrared region (1.0 - 2.5 µm). The observed sky area measures only 2.3 x 2.3 arcmin 2 and is referred to as the NTT Deep Field. It has been studied in great detail, in particular to identify very distant galaxies for spectroscopic follow-up observations with the FORS1 and ISAAC instruments at the VLT 8.2-m ANTU telescope during the first period of VLT observations. Such distant objects are quite red (due to their high redshift) and are best detected by a combination of visible and infrared exposures. The astronomers noted a star-like object of extreme colour in this field. While it was well visible and similarly bright in both SOFI infrared images (J = 20.2 and K = 20.3), it could not be seen at all on the SUSI images in the visible spectral region, even at the longest wavelength (i-band) observed with that instrument (i-J > 6 mag), cf. ESO Press Photo eso9942 . No "normal" object is known to have such extreme colours. The new object now received the designation NTTDF J1205-0744 , indicating that it was discovered in the NTT Deep Field at the given position on the sky. It seemed that there were only two possibilities. Either it was an extremely distant quasar (redshift about 8) at the edge of the observable universe, or it must be a very cold object in the Milky Way Galaxy. Whatever its nature, this was obviously a most interesting object. This issue was resolved by obtaining infrared spectra of NTTDF J1205-0744 . Despite its faintness, initial observations with SOFI at the NTT covering the infrared J and H-bands already revealed some of the molecular absorptions characteristic of methane brown dwarfs. More recently, complementary longer wavelength observations with ISAAC at the first VLT 8.2-m Unit Telescope (ANTU) at Paranal have now confirmed the nature of this object. The combined SOFI/ISAAC infrared spectrum shown in ESO Press Photo eso9942 is clearly extremely similar to that of Gliese 229B , the first Methane Brown Dwarf discovered a few years ago and which is a member of a binary system at a distance of about 19 light-years. 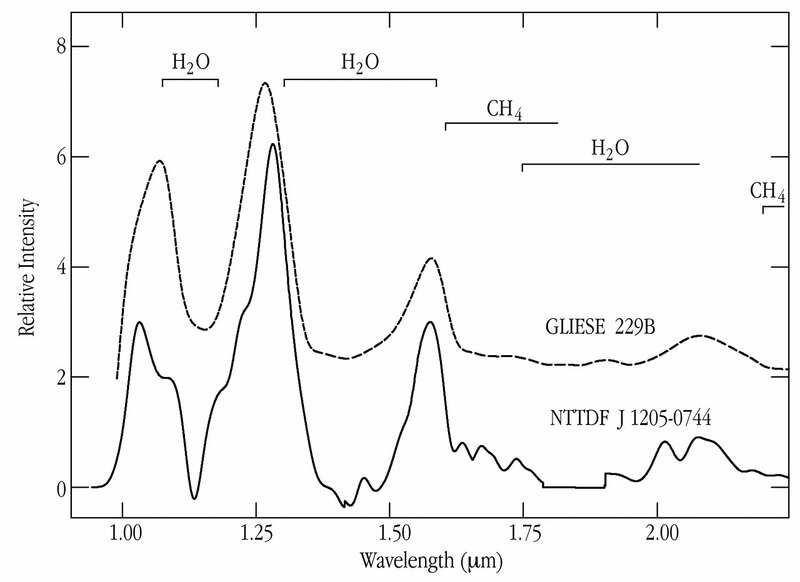 The features in the spectra result from strong absorption by methane (CH 4) and water (H 2 O). There is thus no doubt that NTTDF J1205-0744 is of the same type (stellar class T). Unlike Gliese 229B , however, it does not appear to be a member of a binary system. It is also 5-6 magnitudes (i.e., a factor of about 250) fainter than this and a few similar objects discovered recently in large-area sky surveys, implying that it is considerably more distant. NTTDF J1205-0744 is located at a distance of about 300 light-years (90 pc) and some 240 light-years (75 pc) above the plane of our Milky Way galaxy. Its mass is probably about 20-50 times that of Jupiter, or less than 2% of that of the Sun. Its temperature is around 700 °C (1000 K), suggesting an age of 500 to 1,000 million years. Lacking a stable source of energy at its centre, it is becoming continuously fainter and cooler and will continue to do so for tens of thousands of millions of years. NTTDF J1205-0744 is a very faint and small object indeed, on the still not well understood border zone between stars and planets . How many T-class objects are there in the Milky Way? What is the space density of these extreme objects? Since only a few have been identified so far, any statistics must be quite uncertain. Until now, the best estimates have been of the order of 1 per 3,500 cubic light-years (0.01/pc 3). A surprising aspect of this discovery is that NTTDF J1205-0744 was found within a sky area of only 2.3 x 2.3 arcmin 2, specially selected to be as "empty" as possible in order to facilitate studies of distant galaxies. Based on the above density estimate, the chance of finding such an object should only have been about 1%. Based on model predictions, the chance would have been even smaller than this. Searches like the one described here, based on the combination of optical and infrared data, therefore appear particularly effective at detecting such objects. It is now of high interest to test if this first discovery was just extremely lucky, or if the space density of these extreme objects is in fact much higher than expected. The team consists of Jean Gabriel Cuby, Alan Moorwood, Sandro D'Odorico, Chris Lidman, Fernando Comeron, Jason Spyromilio (ESO) and Paolo Saracco (Osservatorio Astronomico di Brera, Merate, Milan, Italy). A more nearby, hotter brown dwarf, KELU-1 , was found at La Silla in 1997 at a distance of 33 light-years, cf. eso9707. A research article about these new results (Discovery of a faint Field Methane Brown Dwarf from ES0 NTT and VLT observations), will appear in the European journal Astronomy & Astrophysics .